Bob Budzynski is a man whose infectious love of dance is always evident and his energy has been a driving force in the Swing Dance World. He and his wife, Beverly have promoted Swing and other dances in their Grand Blanc, Michigan area for many years, and they are in large part responsible for the popularity of Swing in the Michigan area. Bob is a D.J., a competitor, an instructor, and a private promoter. 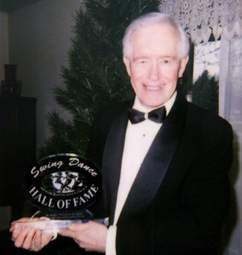 He and Beverly founded the “Michigan Society for Swing and Hustle Dancers Club” (that is still going strong) shortly after founding the prestigious “Michigan Dance Classic.” In total, they’ve hosted twenty-eight dance events. Growing up in his family, if you didn’t dance Polka by age seven, you were considered “retarded.” You can see by this statement that his family was musical. He learned to play the Accordion and by the time he was sixteen he had his own band. Dancing was a sideline but what a sideline. Just like today, girls loved guys who could dance. Knowing this, he worked on his dancing in high school and was voted the schools best male dancer. During his first college years, he worked at “General Motors Overseas Operations” in the transportation department, but hated his job. Much to his father’s chagrin, he left GM to work at Fred Astaire’s Dance Studio. During his junior year, he transferred to a university in Houston, Texas to work at the largest Fred Astaire Studio in the U.S. Graduating with a degree in music, Bob opened his own music store that he owned for almost seventeen years. He taught Accordion and social dancing throughout those years. Then, in his thirties and forties he continued teaching East Coast and Ballroom dancing while holding other professions. After meeting Beverly, he started attending dance competitions and becoming more involved in dancing. He accidentally discovered West Coast Swing when they attended Robert Bryant’s United States Swing Dance Championships. Robert convinced him to start a Michigan event, which became the “Michigan Dance Classic”. This event has been held continuously for fifteen years, with Bob and Beverly in charge as directors for the first twelve. When he started the event, Bob did not consider himself a good West Coast Swing dancer. So, he studied with Mario Rabau Jr., Robert Bryant, and Skippy Blair, (among others) traveling across the United States, determined to learn the dance correctly. Three years after the Michigan Dance Classic was in full swing, Bob and Beverly started the “Mid-United States Jack &amp; Jill Championships” (that they’ve retired from) and the “Petoskey Party” that is still being held in Northern Michigan. Over the years they have also competed across the country in Masters Divisions, Jack &amp; Jill’s, etc. As a result of their efforts and competition results, they received two “Feather Awards,” presented in 1996 and 1997. Bob has won five first place awards in major Jack &amp; Jill Championships, in addition to the accomplishments listed below – many Bob and Beverly accomplished together.